Roughed out the first 10 days of the route tonight. Had some trouble embedding the Google Maps, so you’ll have to be brave and live with links for now. Take a look. I also updated the Bike Page. There’s a few extra mods I want to make, and I’ve also added links to a few extra resources. I love simple but clever stuff. I first stumbled on these a couple of weeks ago, and have since found that there are a few brands on the market. 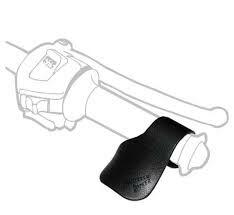 The Throttle Rocker uses a simple velcro loop-back to clamp on to the hand-grip. It only comes in one style, but it looks good, and there are left and right-biased versions, depending on which part of your hand you want to rest on it. The Cramp Buster seem to just use its own shape to grip the hand-grip, and it comes in narrow and wide versions. Clever. It’s as close as I would want to get to cruise control on a bike. I wonder if they’re legal in Australia. I’m probably getting a little ahead of myself here, but that’s not unusual. As part of my thoughts about communications and electrics on the bike, I’ve been thinking about the PTT (push to talk) switch for a UHF radio. There’s a few options, from more permanent fixtures through to velcro-on buttons. My current radio was a wonderful investment from Aldi (not known for their communications or motorcycle accessories – but it was cheap), and it came with helmet speakers, a flexible boom mic and a PTT switch which you could velcro to the handlebars or to your finger. Either way, it wasn’t great. The finger Idea was just fiddly, since it got in the way of gloves (on the outside, not the inside), and there really wasn’t a practical place to mount it on the handlebars. A friend roughly mounted his over the standard indicator switchgear, but that was awkward, and it was still quite hard to press the button while riding. Sadly, the StarCom1 comms integrator that I’m looking at ships with the same switch. Thankfully I’m not the first person to think of this (lets assume that goes for most things, eh?). There’s a range of after-market switches available. Most resemble a plastic “kill” switch or a cut down version of the indicator/lights/horn switchbox. The trouble with all of these is that they take up handlebar real-estate, which means that either the after-market unit or the original indicator switch is going to end up too far from your left hand to make it useful. Some of the cleverer solutions offset the switch housing above or below the handlebars, and mount to the bars with a thin clamp – thin enough that the indicator switch is not pushed too far to the right. Another (beautiful) solution is a polished aluminium slimline switch housing. This one comes in single and double swich configurations, and is just stunning. But the more I think about it, I reckon this one might be the best yet. It places the button right where your thumb would reach if you fully extended it, which means it’s out of the way, yet completely accessible without moving your left hand. The switch comes as an accessory for some freakish quick-shift device, which lets you change gear without easing off the throttle or touching the clutch, from what I can tell (there’s something about that which makes me not want to ask questions). It’s a shame that a simple switch like that sells for around $US100. It makes much less compelling options suddenly seem more viable. Still, I might be able to get one for less when the time comes. I’m determined that whatever this trip turns out to be, it will be captured on video. Considering how cheap standard definition DV cameras have become, it’s reasonable to assume that each rider on the trip could carry a a camera either in a tank bag or in a pocket. If the person at the front of the pack gets far enough in front, they can stop and shoot the other riders coming past… that sort of thing. I’ve also mentioned to Andy and Lyn, the likely drivers of the support vehicle, that they’ll become part of the “crew” when they’re in range of the bikes. But what has interested me for some time is the idea of helmet camera. Most of these consist of a “lipstick” camera and mount, attached to a power source and a DV camera, operating as a VCR. I’ve been hesitant to invest in one of these so far. A tape-based recorder on a bike (particularly one that is recording at the time) is vulnerable to dust and vibration, not to mention damage in a fall. There’s also no practical way to see what you’re shooting while you’re shooting it, short of mounting the DV camera to the handlebars with the screen open – further exposing the equipment to the elements. The other big draw-back is the lack of control. Remote (LANC) cables are expensive (considering what they do), and pressing the record button on the camera itself is often impractical. There’s also the problem of the recording medium. While DV tapes are cheap, to record non-stop on the off-chance that something might happen is just not practical, and to fumble for the record button just after that emu has run out on the track in front of you is a pointless. I have experimented with directly mounting a DV camera to a dirt bike, as you can see in this video clip. I wrapped the camera in a tailored piece of wetsuit material to keep some of the dust out, but I still had to resign myself to the fact that the camera might not come out of the experiment alive. I’ve recently found a couple of solutions which address just about all of the limitations of a standard helmet camera. The one I’m most impressed with is the VIO POV1. It uses a waterproof camera (actually, the whole thing is pretty much waterproof) connected to a small recording device, which includes a screen and simple controls and records to SD card. The manufacturers claim that it can capture around 45 minutes of DVD-quality video on a 1GB SD card (though it can take up to 2GB). What I love about the POV1 is th wireless remote, which you can strap to your wrist or handlebars. 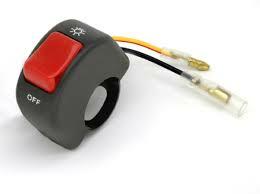 It includes a TAG button, which effectively allows you to capture an event after it has happened. The camera can be configured to capture video constantly, but it will only commit footage to the card permanently when the TAG button is pressed. It can be programmed to keep the preceding 15 minutes or more of footage, which means the operator can choose to record an event after it has taken place. The camera comes with a range of mounting options, though there doesn’t seem to be a standard tripod thread anywhere on it, which is unfortunate. It would also be nice to be able to mount the capture unit and screen easily, though I’m sure a RAM mount and some cable ties will be able to solve that problem. I actually think that at times the rider’s helmet is not the best place for a camera like this, unless the rider is very aware of the camera, and holds his head quite still. The one advantage is to be able to capture the rider’s point of view when something unexpected happens. Mounts on the fairings, facing forward and back, would capture some great footage. Another thing I’m looking forward to trying is to use a long RAM mount arm (or one made of a series of clamps and balls, like the one pictured, only longer) attached somewhere to the front of the bike, which would allow the camera to capture the rider and the action behind. Having a long arm sticking out from the bike like an over-excited mirror poses some risks, but since the camera would weigh very little, I think I’d get away with it, particularly on paved roads. Could make for some interesting footage. It’s funny the rabbit-holes you go down when you’re looking for (or at) things. I followed a link from Eastern Beaver to Ted Simon’s site – of Jupiter’s Travels fame. I’d read about Ted in a bike mag a few years ago (come to think of it, it was over 5 years ago, when I was shopping for my last bike… but I digress), just after he’d broken his leg. Even then this guy impressed me. He was 69 when he decided that riding around the world again was a good idea. Classy. Haven’t got to my point yet. I should do that. Ted Simon ditched a lot of the gear he was carrying when he got to Melbourne, finally realising that since he was generally known, he really didn’t need to camp all the time, or at least didn’t need to assume that he was alone in whatever county he was visiting. He sent his panniers and some other gear home, and acquired some soft panniers (I’d call them saddle bags, but that’s just me) from a guy in Melbourne. Andy Strapz (for the moment I don’t know whether to refer to it as a person or a company) makes some really clever and functional motorbike gear. I love the flat strapz, and I think I’ll add those to the must-have list. As much as I love the ol’ ROK straps, the idea of adjustable tie-downs with just a bit of spring in them appeals to be, particularly on a long journey. The soft panniers are really smart, too, Rather than a zip-up affair that gets wider (if anything) with the amount of stuff in it, these effectively get taller. Also, they roll down to the level of the stuff you’re carrying, so everything is held firm. When Andrew and I did the 10 day ride in Tasmania in 2004, we kitted ourselves up with saddle bags and back packs. The saddle bags were great, though the tie-down points took a beating in a couple of falls. We learned over time that they didn’t need to be tied down all that well, since they would rise, fall and bounce at about the same speed as the bike anyway. I probably wouldn’t do the back pack thing again, since I’d rather that the weight moved with the bike and not me, and I’d prefer not to be lumbered with the weight first-hand. So some other solutions are in order. I know I’m plugging the Wolfman gear at the moment, but there’s a lot to like about it. There’s a smaller “lite” bag which is exactly the same design and footprint, but smaller. Both make use of a KLR mounting harness, which I’m assured works with the 2008 model as well. These were great on the Tasmania trip. If I can find a place for them forward of or below) the Beta, I’ll use them again. That said, they’d probably be the last item I’d add, reserved for the longest trips. Spent a little bit of time looking into communications and power solutions for the bike. To me, an integrated solution is the only real way to go. That means that the GPS, mobile phone, UHF radio and iPod would all need to get to the helmet’s speakers (or the rider’s earphones) in some order of priority, and the rider’s microphone would need to get to the mobile phone, the UHF radio and the helmet or bike-mounted camera recorder. Sounds tricky, but it seems that it can be done. I’ll cover that in more detail another time. The next issue is how to power it all. Ideally everything would be rechargeable, but would power or charge from the bike’s electrics. The KLR (and bikes of its size) can power high intensity driving lights at a pinch, so a collection of small gadgets shouldn’t be too much of a strain. Still, it will be important to fuse things properly, so that one mishap doesn’t wipe out the whole bike. How to mount and store things will also be a challenge. Some devices aren’t waterproof, dust-proof or shock-proof, so they can’t afford to be mounted on the handlebars. Besides, some of them won’t need to be accessed while riding. At this point it looks as though a GPS would be the only thing that needs to be on the handlebars of the bike. Everything else can be stored in a tank bag. There’s a number of 3rd party fuse boxes on the market. One great resource (for research, and probably for buying), is Eastern Beaver, a site which specialises in motorbike electricals. There are a number of fusebox options, but this one can be easily mounted and is reasonably well protected. My only concern is that the contacts are simple spade connectors, rather than screw-in wires. What I’m not sure of yet is whether I’ll even need something this elaborate on the bike. Since most powered items will be in the tank bag, I might only need a couple of inline fuses on the bike, and the rest can go in the bag itself. It appears that there are two main classes of power connection for a bike. The first is the cigarette lighter connection. The limitation of these is that they are a little large, and there aren’t as many options for rugged, waterproof sockets. The advantage of these though is that any device that needs a custom power adapter – to alter voltage, for instance – can connect directly to the socket. The other option is commonly referred to as the BMW outlet, presumably introduced or made famous by BMW motorcycles at some point. These are smaller and better looking, and there are more mounting options available, but devices with power adapters will need to be modified to use them. Since most of my gadgets will be in the tank bag, these are still the preferred option for me. Of the available BMW-style outlets, I’m most impressed with the Powerlet Powerbar Plus. This block will clamp on to most standard handbars, and the wiring trails out the bottom of the unit into the body of the bike. A RAM Mount ball can also be fitted to the other half of the unit, making it a mounting bracket for the device that it is powering. Sockets mounted flush to the bodywork are significantly cheaper, but since I need 2 sockets at the front, and I want one of them to power and mount the GPS, I might as well make both of them the same and not have to drill into the fairing. Not sure where this will end up, but the process is fun. It started… gee, where did it start? Technically it started nearly 6 years ago, when I saw some dirt-bikers in the high country while on a 4WD trip. My best friend and I made ourselves the promise that we’d do the same by the end of the following year, and we kept that promise. We did some homework, ordered matching bikes, and in one July day we sat our learner’s permits and picked up our new rides. I guess for me it had always been about adventure riding more than dirt-biking, though I didn’t know there was a difference back then, and there certainly wasn’t a dual-sport bike to be had in the 250cc range. We settled on Kawasaki KLX250’s. 4 stroke. Water cooled. Quiet. Gutless. Perfect. Our kept promise took us back to the high country on our own bikes later that year. Two complete rookies, doing what we set out to do. And not particularly well. But we had a ball, and were well looked after by a couple of experienced riders who have since become great friends. April the following year we planned and executed a 10 day trip through central and western Tasmania. We set ourselves up with back packs, saddle bags, a GPS and a tent, and off we went. It was an unforgettable adventure: two green riders on green bikes with bright yellow L plates. What an absolute blast! Over the years in between we’ve continued to ride, though the stuff of life has all too often got in the way of getting out on the bikes. Though it took me a while to realise it, I was also frustrated by the fact that my bike really wasn’t set up for extended journeys on-road. Mostly I’d leave it at my friend’s place, since we rode together and he lived closer to the tracks we liked. But even when I had it at home it was never a daily ride. I toyed with getting a road bike, but what I really wanted was something that could go anywhere. OK… confession time. It was after watching Long Way Round and Long Way Down (though not in that order, incidentally) that I got the itch to do something. A little sad, but I might as well admit it now. Plan A was to get the bikes to Adelaide, then stick them on the Ghan to Alice Springs (taking them off for a trip to Uluru etc) and Darwin. This would mean the bikes could still be geared for off-road work, since there wouldn’t be thousands of kilometres of bitumen to negotiate. Half an hour of snooping on the ‘net revealed that the Ghan won’t take bikes unless they’re on a trailer, behind a car. That’s crazy! The Spirit of Tasmania will take them across the wild waters of Bass Strait, but Great Southern won’t take them up a steel track. Which leads us to Plan B, or perhaps Plan A-and-a half: still take the Ghan, but factor in a support vehicle and trailer for every 3 bikes or so. A weekend-long conversation with a great mate and 4WD guru (who immediately nominated himself support crew and relief rider) led to the plan in its current state, which I’ll get to in a minute (be patient). The cost of the Ghan for bikes, cars et al could well be significant enough to make trailering the bikes the whole way on bitumen a viable option. The only trouble with that is it wouldn’t be an adventure ride then. We’d leave the bikes on the trailers til we got to the dirt tracks… and that just didn’t sit with me. So what if we rode the whole way? And that’s where things got exciting and crazy, all at once. One support vehicle, carrying tools, spares and (for certain parts of the trip) fuel. First thoughts were toward a diesel troopie with long-range tanks. Current thinking is favouring a turbo-diesel HiLux dual-cab. It’s cheaper to run, and the wall between the cabin and the spare fuel will make the trip a whole lot more pleasant for the support crew. We’d sell the 4WD when we got back, and split the cost (or profit?) between us. But what about these bikes? They’d have to be able to handle about 8000 km of bitumen, plus long stretches of who-knows-what, while carrying rider, gear, food, water and camping stuff. The LWR/LWD inspiration meant that BMW and KTM were obvious choices. Claudio’s outing on a little Russian bike in the middle of LWR, not to mention countless shots of Ewan and Charley trying to lift the 1150/1200 Adventures, told us that the big BMWs were just too big. (If you don’t know what I’m on about, watch the show.) And the $25,000 price tag was a little steep, too. Next on the radar was the 650 Dakar. Still big, heavy and expensive. What I would have taken if I was an actor getting free bikes to ride around the world… but I’m not. None of the current KTMs really grab me, at least not as a dual-sport bike. The only ones that seem biased that way are big. And they’re expensive too. My internet searching quickly led me to the Kawasaki KLR650. Over 20 years old, but recently updated with a highway-friendly fairing and upgraded bits. Every review I found raved about it, and up against dearer and supposedly toucher machines it seemed to keep winning, and winning over the critics. Those who liked the old one suddenly loved the new one. Road-bikers who wrote it off as a dirt bike were pleasantly surprised at its on-road poise. Dirt-bikers who thought it had gone soft and compromised were stunned to find that it was better off-road than its predecessor. So I took one for a quick spin the other night. Never ridden anything so large in all my life. But I like it. It feels good (not that I know anything), it’s reviewing very very well, and best of all, it’s dirt cheap. I’m not ready to buy yet, but I’ll post here when I am. In the meantime I’m researching the mods, add-ons and accessories that would make this bike a great weekend getaway machine and (if all goes to plan) the bike that will take me on the trip of a lifetime.